Don’t you just love it when you try out a certain restaurant for the first time, and the meal is not just good but truly epic? Such was the case for me last night, with my virgin visit to Little Joe’s on 5th and Mission. All too often we give a new place a go, and the experience is… meh. So when we do actually hit the culinary jackpot, it’s definitely an occasion to be celebrated and remembered. Little Joe’s deserves plenty of celebration, that’s for sure! I was on a spontaneous quest for a good liver and onions, as I simply had the craving and had not yet enjoyed the dish here in San Francisco. After asking around and doing an internet search, my dining destination was quickly set. Little Joe’s is an Italian restaurant, and let me remind you: The Italians know how to feed us! The portions are more than generous, as they should be. The perfectly cooked liver, topped with mouth-watering sautéed onions, consumed the plate. As such, my heaping side of hot kidney bean salad sat on its own. Along came bread as well, and with it the most divine chopped garlic spread… intensely, fantastically garlicky, let me tell you! The Chianti washed it all down smoothly. Best liver in town, so far! Suffice to say, I wanted a GOOD meal, and I hit the bullseye! Not only was it good, it was refreshingly old school, and an epic experience that made my entire night. 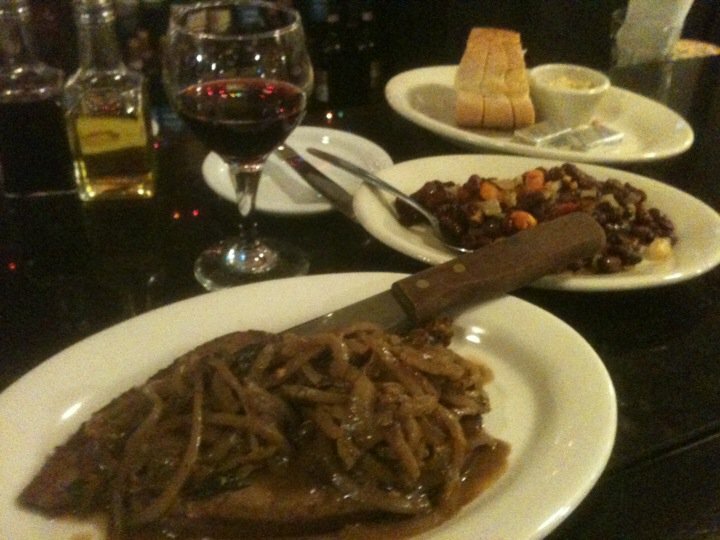 You simply must head on over to Little Joe’s right away, especially if you love liver! If not, you’ll have plenty from which to choose off of the extensive and reasonably priced menu. The space is hopping with energy, comfortably filled with lively patrons seated around a scattering of intriguing pictorial history on the walls. My only suggestion to Little Joe’s is that they dim their bright ceiling lights a bit, as it would enhance the ambiance all the more. Absolutely, divinely, beyond delicious. I hit the culinary jackpot. May my next dining discovery be this perfect!